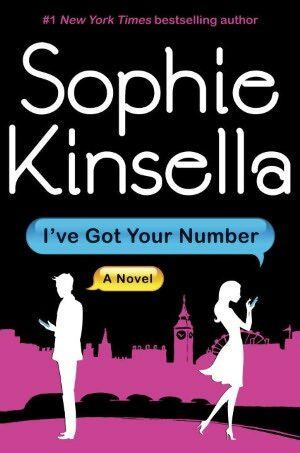 Sophie Kinsella has cloned her loveable, scatter-brained Shopaholic heroine in I’ve Got Your Number. If you’ve smiled with Becky Bloomwood through the Shopaholic series, Poppy Wyatt will not only raise your spirits, but may also have you laughing out loud. Within minutes, Poppy loses her heirloom emerald engagement ring and has her cell phone stolen. The wild ride begins when she commandeers a discarded cell phone and starts a texting relationship with Sam Roxton, a handsome but socially inept businessman. It’s his assistant who quit and threw the cell phone in the trash. Since Poppy needs the phone to communicate with anyone who might find the ring – and others, including the wedding planner – she convinces Sam to let her keep the phone for a while, and promises to forward his emails. The nonsensical situation is ripe for humor, especially when Poppy starts answering Sam’s mail. The romantic comedy includes a little suspense when someone hacks into the company computer to change a message, but Poppy saves the day. Kinsella adds over 100 footnotes – Poppy’s nod to her stuffy academic future in-laws. They lost some of their witty sparkle when placed at the end of the chapter on my Kindle (hopefully the actual book places them at the bottom of the page). By then I’d forgotten the reference. Kinsella has once again morphed Bridget Jones and I Love Lucy into a funny and satisfying distraction, and proves that… “You can be highly intelligent, and also ditzy and klutzy.” The book is a fast satisfying distraction and a good British tonic, if you are out of sorts. If Kinsella is starting a new series with Poppy, I can’t wait for the next one. This entry was posted in authors, book review, books, humor, reading and tagged Becky Bloomwood, Bridget Jones, Engagement ring, I Love Lucy, I've Got Your Number, Madeleine Wickham, Mobile phone, shopaholic, Sophie Kinsella. Bookmark the permalink. I thought I might like this one, but Becky wasn’t for me. Will I still like Poppy? Poppy has a little more substance than Becky, but not much. Poppy has a past, and her knight in shining armor helps her to gain some self-confidence (don’t think Becky had that problem). Just a fun read. Okay, I’ll give Poppy a try! I got this book as a free download from the (Dutch) publisher. I’m looking forward to it except I didn’t really like Becky Bloomwood, I found her TOO silly adn scatterbrained. Hope Poppy is a little bit more sensible. But the story sounds great. Glad you enjoyed it! Kinsella gives Poppy a tragedy in her past to explain some of her actions and mindlessness. If you can accept the ridiculous premise, it’s a funny romantic comedy. Hope you enjoy it. I can be quite generous in accepting certain premises so I’ll probably like it. My favorite Kinsella is The Undomestic Goddess – I liked the Shopaholic series least of her books. Looking forward to reading it!